The following draft guidance was released by the U.K. Home Office on March 26, 2013 and concerns retention periods of biometric data in cases involving national security determinations. 2. This guidance is to provide direction to any police force or other law enforcement authority regarding the retention and use of biometric material for national security purposes through the making or renewing of a national security determination (“a NSD”). 3. This guidance is issued pursuant to section 22 of the 2012 Act, which places the Secretary of State under a duty to give guidance about making or renewing of a NSD under the provisions set out in section 20(2)(a) of the 2012 Act. 4. This guidance is publicly available and, in particular, should be readily accessible by members of any police force or law enforcement authority seeking to extend the permissible period of retention, for national security purposes, of DNA profiles or fingerprints which they have hitherto retained. 5. Only a law enforcement authority listed under section 18E(1) of the Counter-Terrorism Act 2008 or specified in any order made by the Secretary of State under that section may make or renew a NSD. 6. This guidance is admissible as evidence in criminal and civil proceedings. If any provision of this guidance appears relevant to any court or tribunal considering any such proceedings, or to the Commissioner for the Retention and Use of Biometric Material (“the Biometrics Commissioner”) overseeing the relevant Part of the 2012 Act, it can be taken into account. 7. A law enforcement authority may also be required to justify, with regard to this guidance, the retention, destruction or use of material held pursuant to a NSD, where appropriate. 8. Part I, Chapter I of the 2012 Act provides for the making or renewal of NSDs for biometric material acquired under specific legislation. The retention periods and the relevant legislation are provided for by Part I, Chapter I of the 2012 Act and are set out at Chapter 2 of this guidance. 9. This guidance extends to the United Kingdom and applies to all relevant law enforcement authorities within it. • Set out the basic principles that underpin the powers of a responsible Chief Officer or Chief Constable authorised to make or renew a NSD extending the retention of biometric data. • To set out the threshold for making or renewing a NSD and the way in which those powers may be exercised. • To promote the fundamental principles to be observed by those authorised to make or renew a NSD under provisions mentioned in section 20(2)(a) of the 2012 Act and to ensure the effectiveness of the use of those powers to retain biometric data for national security purposes. • To ensure that any interference with the right to respect for private and family life (Article 8 of the European Convention on Human Rights (ECHR)) of persons to whom the data belongs is necessary, proportionate and in accordance with the law. • To confirm that a responsible Chief Officer or Chief Constable is required to justify the use of such powers, in relation both to the making or renewal of individual NSDs and the general pattern of their use, to the Biometrics Commissioner or in court. Any misuse of those powers is likely to be harmful to national security (particularly counter-terrorism) and to undermine public confidence in those law enforcement authorities permitted to exercise such powers. All Chief Officers or Chief Constables authorised to make or renew NSDs must be able to explain and justify their decisions to exercise those powers to the Biometrics Commissioner. 21. 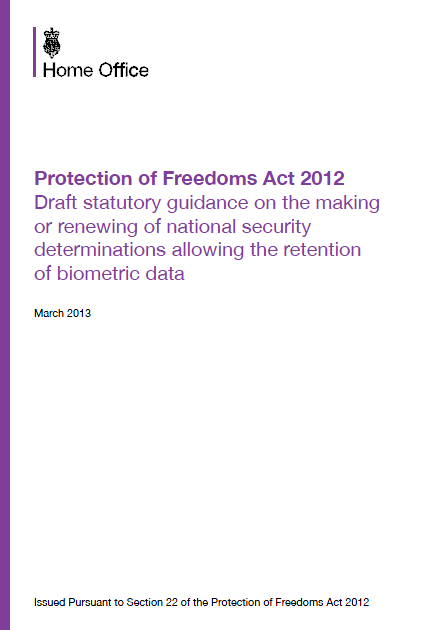 The Protection of Freedoms Act 2012 prescribes the periods for which certain types of biometric material may be retained. The 2012 Act amends the system in England and Wales governing the retention of DNA and fingerprints taken from those persons who are arrested for, but not convicted of an offence. This is in order to ensure that DNA and fingerprint material is only retained indefinitely where a person has been convicted of crime, or for a specified period where a person has been arrested for, but not convicted of a serious offence. f) Retain material with the consent of the person to whom that material belongs as long as that person consents in writing to its retention (although a person may withdraw his or her consent at any time and if they do such material must be destroyed). g) Destroy DNA a sample as soon as a profile has been derived from it or within 6 months of it being taken – whichever is sooner. 29. 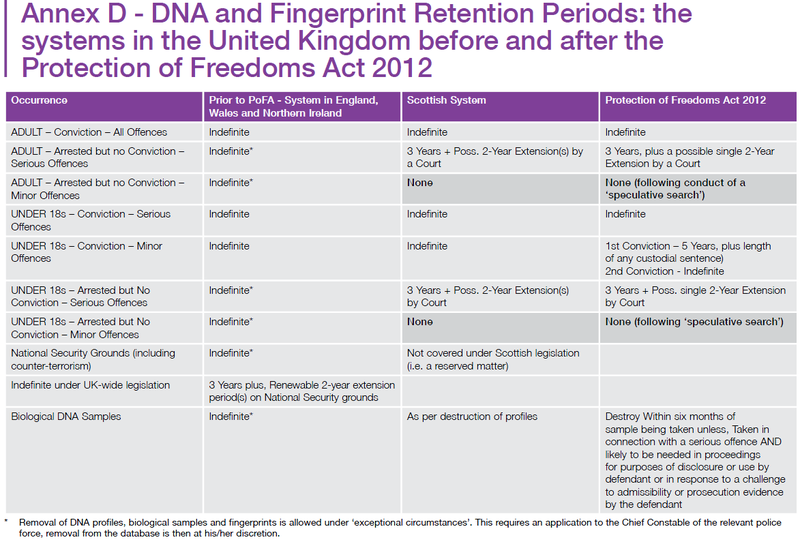 The 2012 Act amends various pieces of legislation dealing with the retention, destruction and use of biometric material and in doing so also allows for DNA profiles and fingerprints taken or obtained under relevant legislation, to be retained for an additional period of up to 2 years for national security purposes. This period of extension is renewable. Such extensions are overseen by the Biometrics Commissioner, who has the power to order destruction of retained material where they consider that the criteria for extended retention have not been met. 30. A summary of the retention periods for England, Wales and Northern Ireland and for the separate system in Scotland is set out at Annex D.